Doctors have called on the government to suspend plans to fine social services departments which fail to provide adequate community facilities for patients ready to leave hospital. The initiative, contained in the Community Care (delayed discharges) Bill, is designed to tackle the problem of bed blocking - where patients are kept in hospital because they have no where else to go. Ministers have already had some success in addressing the issue following a cash injection of �300 million in October 2001. 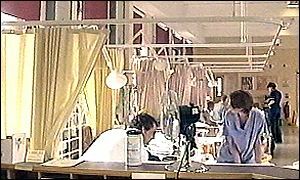 Latest figures show that between September 2001 and September 2002, more than 1,500 fewer people were waiting to be discharged from hospital on any single day. However, the British Medical Association has warned that social services departments will not be in a position to make full use of the extra funding if a system of fines is introduced. The BMA is calling for the introduction of fines to be delayed for a year to give social services departments more time to tackle the problem. Speaking ahead of the second reading of the Bill in the House of Lords debate on Monday, Dr Andrew Dearden, chairman of the BMA's community care committee said: "We are already beginning to see improvements in some areas where social services departments have been able to use the extra funding effectively. "This bill, which would require local authorities to reimburse the NHS on a daily basis when the discharge of hospital patients is delayed by social services, would place further financial pressure on already stretched local authorities. "Charging hefty 'fines' will just place an even greater burden on them. "There should be an initial period of pump priming social service departments with funding to allow them to build up capacity before they are faced with penalties." Lord Clement-Jones, Liberal Democrat health spokesman in the House of Lords said the proposals would create "trench warfare between the NHS and social services." "Mr Milburn's plan will create perverse incentives in health and social care; undermine co-operation between the NHS and local government; drain local government of money without creating more capacity in social care and increase suffering for elderly people and their families." Health Minister Jacqui Smith welcomed the fall in the number of patients whose discharge had been delayed, and said the government was committed to eradicating the problem. She said more intermediate care beds had been made available to provide a bridge between hospital and home.